For this edition of our Then and Now series, we’ve selected one of Rolex’s oldest sports watch models still in production today—the Explorer. Although we’ve clearly demonstrated in our past Then & Now articles that Rolex has a knack for maintaining fundamental design details of a particular watch while still managing to vastly improve the model, the first Explorer and the most current Explorer are remarkably similar—even for Rolex standards. Let’s investigate this exemplary display of consistency by comparing the inaugural Rolex Explorer with its most modern version. On Friday, 29 May 1953, Sir Edmund Hilary and Tenzing Norgay made history by becoming the first men to reach the summit of Mount Everest—the highest mountain in the world. Since many had tried before but failed, this was momentous news that was celebrated around the world. According to Rolex lore, several men on the expedition, including Tenzing Norgay, had on Rolex Oyster Perpetual watches during their treacherous adventure. 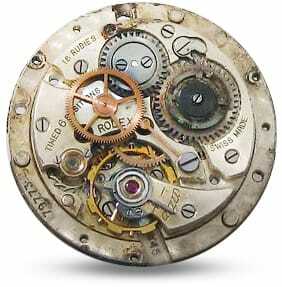 So in honor of the ascent, the company came out with a new Rolex ref. 6350 later on that year and dubbed it the Explorer. Built in stainless steel, the Rolex Explorer ref. 6350 includes a 36mm Oyster case, a Brevet winding crown without crown guards, and an Oyster bracelet. It is a time-only model with a black dial (in some cases a honeycombed pattern one), luminescent Mercedes-style center hands, and luminescent indexes with numerals at 3, 6, and 9. In fact, the 3/6/9 index configuration of the watch became its signature trademark—so much so that this layout is now referred to as the Explorer-style dial. Beneath the large bubble caseback of the Explorer 6350 is the self-winding Cal. A296 movement. Although Rolex released a slew of bigger and more complex models like the Submariner, GMT-Master, and Daytona after the Explorer, this modest watch continues to be a part of the company’s collection. It is precisely the Explorer’s unassuming classic style, robust construction, and an accessible price tag that makes it’s a fan favorite. The most current iteration of this watch is the Explorer ref. 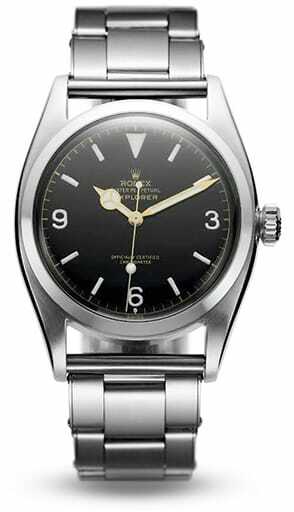 214270 and while it is undoubtedly a modern Rolex watch, it has an uncanny resemblance to the original. The first edition of the Explorer ref. 214270 came out in 2010 and Rolex followed it up with a revamped model (but same reference number) in 2016. The Explorer ref. 214270 was the first Explorer to grow to 39mm in diameter. Like its predecessors, it’s only available in stainless steel, has no crown guards, and includes an Oyster bracelet. Also like earlier Explorer watches, the ref. 214270 houses a black time-only dial with luminescent accents, and of course, includes the oversized 3/6/9 numerals. It’s worth mentioning that Explorer ref. 214270 watches made from 2010 to 2016 do not include luminescence in the 3-6-9- numerals while those made in 2016 and after, do. The Mercedes-style hands are still there, as is the inverted triangle at 12 o’clock. But unlike the inaugural Explorer, the new ones all come with scratch-resistant sapphire crystal protecting the dial. Powering the newest Explorer model is the self-winding Caliber 3132 with 48 hours of power reserve. This is the same in-house movement Rolex uses in the modern Oyster Perpetual 39 watches, as well as the modern Cellini Time watches. Looking at the first Rolex Explorer ref. 6350 and the newest Rolex Explorer ref. 214270 side by side, it’s clear that Rolex understands not to mess with great design. Rolex nailed the look of the Explorer pretty much from the get-go and now the company simply focuses on improving the technical and practical aspects of the watch. Arguably one of the easiest Rolex watches to own, collect, service, and wear, the simplicity of the Rolex Explorer is the main reason it has withstood the test of time. With over six decades of history behind it, we wouldn’t be surprised if the Explorer maintains its characteristic style for the next 50 years.